As per a World Bank study, by 2031, some 600 million people are expected to live in India's cities. However, only about 20 Indian cities with populations over 500,000 have any kind of organized public transport systems. In fact, the share of public transport in large Indian cities actually declined from some 70 per cent in 1994 to almost 40 per cent in 2007. Furthermore, India's accident and fatality rates are among the highest in the world, mainly affecting the poor and vulnerable who do not have their own means of transportation. City transportation is an important pillar for quality of life of citizens in a city. Currently, in most of the cities, public and private road transportation are the key mode of commuting and logistics. Some large and mega cities have metro and local train network as the backbone transportation mode. 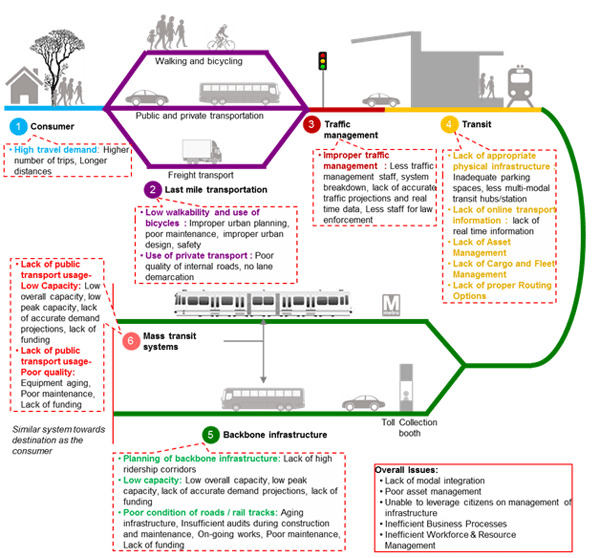 Lack of quality and safe public transportation, inadequate capacity of public transportation, road safety concerns, overcrowded road network, poor traffic management, parking issues, theft, poor road conditions, lack of modal options (including pedestrian walkways) remain the key issues in most of the cities. Most cities also lack the integrated transportation plans leading to huge demand-supply gap and poor transportation network. For transport operators, huge demand-supply gap, under recovery and poor asset management remain the key issues. Technology plays an important role by predicting demand and supply data to feed into transportation planning. Technology can also help in improving reliability of public transportation network by providing visibility on arrivals/departures/route information for travellers for hassle-free journey. Multi modal fare integration can help citizens to use multiple modal options without hassle of purchasing different tickets. Intelligent traffic management can aid efficient traffic flow. Bicycle sharing system: A bicycle sharing system, public bicycle system, or bike share scheme, is a service in which bicycles are made available for shared use to individuals on a very short-term basis. For many systems, smartphone mapping apps show nearby stations. They show how many bikes and how many open docks are available at each station, increasing convenience for users. Geospatial-enabled efficient transportation system: Geospatial-enabled services provide periodic traffic forecast, journey planning mobile applications based on real-time data, etc. Dynamic carpooling/car sharing: Carpooling applications link drivers and passengers in real-time, thus enabling dynamic carpooling. Drivers wishing to profit from their journeys can find people situated on the same route via a smartphone app and vice versa. Passengers can also directly debit his or her fare to app, eliminating the need for any money exchange. The costs of travel would typically be capped. GPS-based tracking and route information of public transport: Advanced vehicle tracking solutions enhances operations and optimises public transportation and ridership. These solutions offer real-time GPS tracking from mobile devices thus increasing the reliability of public transportation. 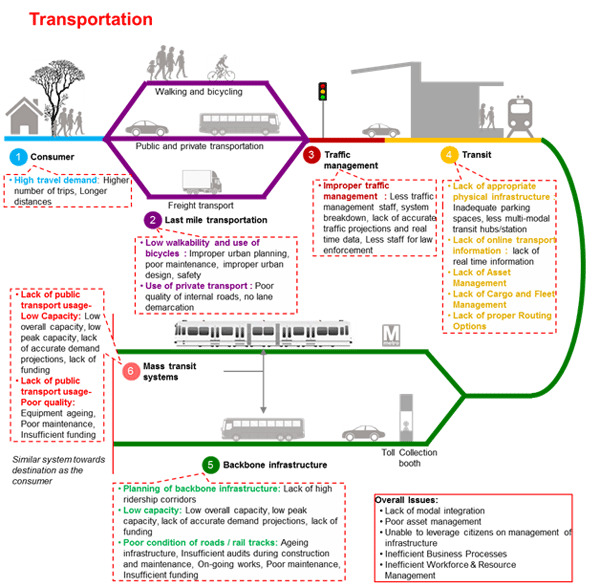 Integrated transit hubs: Integrated transport hubs seamlessly connect multiple modes of transportation like bus system, metro system, etc. Public transport surveillance: As the public transit population grows, it becomes increasingly important to launch surveillance system on the public transport, for e.g. buses, mass transit railway, underground, and trains to secure public transportation. The administrators can monitor the public transport remotely and take action against any accidents/incidents. The video footage can also be used as legal evidence against damage or criminal action on the public transport. Road user charging: Road user charges are direct charges levied for the use of roads, including road tolls, distance or time-based fees, congestion charges and charges designed to discourage use of certain classes of vehicle, fuel sources or more polluting vehicles. These charges help to reduce peak hour travel and the associated traffic congestion or other social and environmental negative externalities associated with road travel such as air pollution, greenhouse gas emissions, and visual intrusion, noise and road accidents. It can be leveraged in certain busy areas or selected cities to discourage private transport usage. Single fare card: Single fare card for fare payment on the various participating public transportation systems. The cards can be recharged by mobile applications/internet/retail outlets. Potential extension of the cards could also be for street parking. Smart parking: A smart parking leverages parking sensors, cameras, smart parking solution, etc. to provide efficient management of on street and off street parking spaces. Smart toll: Smart toll leverages technology like number plate detection, RFID, etc. to charge toll fees to user account so that vehicles do not have to wait at toll gates on local, national and state highway. Smart traffic lights: Smart traffic lights leverages technology to sense traffic condition to tune traffic lights which enable smooth flow of traffic. Freight ICT services: Freight ICT applications can help save time and energy by improving the efficiency of freight vehicle operations including processes at entry and exit and making better use of the freight network. ICT brings the potential for virtually unlimited data collection, greatly enhanced predictive capabilities, and real-time, dynamic decision-making and implementation which lead to a more efficient freight system based on completely visible and accessible physical and digital networks. Electric vehicles: Support electricity and renewable energy operated cars with the required infrastructure. Make a few cities as pilot for "Plug-in" ready cities by facilitating the expansion of a Public Electric Vehicle (EV) infrastructure that ensures the safe, reliable, and efficient integration of EV charging loads with the power grid. Transportation is a key pillar for quality of life in a city. India needs a balanced focus in terms of improving/extending transportation infrastructure and leveraging smart technology solutions. While, there is lots that needs to be done to improve/extend public transportation infrastructure in Indian cities and Government of India is investing in various national/ state/ local initiatives to improve public transportation, there is also need to leverage Smart Technology Solutions to quickly improve efficiency/capacity of public transportation and to create high quality public transportation system.